Nail Polish Lottery Club ~ Week 38 ~ Nails Inc. Recently I received the nicest nail mail from my friend Carla , who lives in Germany and writes a great nail blog. I hope you check her out, she has an amazing collection of CHANEL, both new and vintage that she so generously shares with all of us. 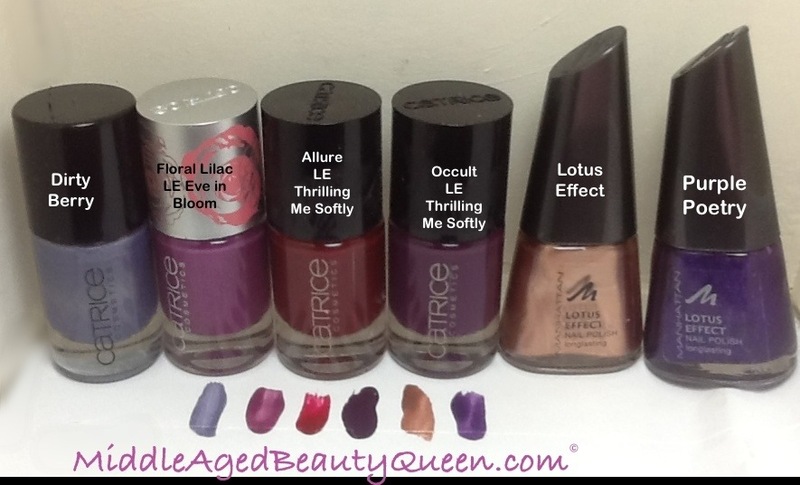 From the selection she sent, I thought the first one I would try would be the Catrice Florlliac but actually the first one was Allure from Catrice’s Thrilling Me Softly collection, which I believe is a new collection. Allure from Catrice is one of the prettiest red nail polishes I’ve seen and now own. It is most definitely red, and has just a touch of a metallic finish which gives it so much interest. It is not a metallic finish, it is a cream finish. When the light is just right you do see a bit of metallic. Like I said it is an interesting polish . I’ve enjoyed wearing it the last couple of days, and I know this will be one of my favorites this fall and winter. Especially during the holidays. It’s a great party color. I just noticed from the pictures I have some clean up to do, which can be expected with a bright red. I did not use an extra base coat except for my Nail Envy by OPI which as you all know, I never do my nails without Nail Envy first applied to my bare nails. One of the things I like about Catrice brand of nail polish is they will mark on the bottles things like “Be sure to use a base coat” –Be Pool, a blue polish or This polish requires 2 coats” Sold Out Forever – a very light green/blue . Upfront you know what you’re getting into. Just another of the many reasons I like this brand so much! Catrice brand is made in Luxembourg, and not available in the states, except I did find it on Amazon. If you go to Amazon you will find a good selection of 12-15 Catrice nail polish. If you haven’t tried it yet, what are you waiting for? It is a great polish. The round bottles are .33 ounce, and the brush is a little bit wider then say a Revlon brush, but not as wide as Wet N Wild Mega Last or Sally Hansen CSM. The brush is very manageable. You know I’m giving this one 5/5 stars 🌟🌟🌟🌟🌟. Great color, great brand and great friends is what I think of when I hear the name Catrice and I hope you all get a chance to try it. 1 Response to "NOTD: Catrice Allure from “Thrilling Me Softly” Collection"
Lovely colour on you, Judi. I read a lot about Catrice, someday I’ll have to try a couple of shades.